Mercenaries have been with us since the dawn of civilization, yet in the modern world they are little understood. While many of today’s freelance fighters provide support for larger military establishments, others wage war where the great powers refuse to tread. 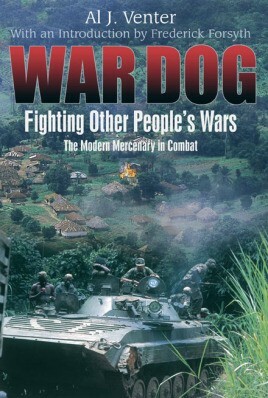 In War Dog, Al Venter examines the latter world of mercenary fighters effecting decisions by themselves. In the process he unveils a remarkable array of close-quarters combat action. Having personally visited every locale he describes throughout Africa and the Middle East, Venter is the rare correspondent who had to carry an AK-47 in his research along with his notebook and camera. To him, covering mercenary actions meant accompanying the men into the thick of combat. During Sierra Leone’s civil war, he flew in the front bubble of the government’s lone Hind gunship—piloted by the heroic chopper ace “Nellis”—as it flew daily missions to blast apart rebel positions. In this book the author not only describes the battles of the legendary South African mercenary company Executive Outcomes, he knew the founders personally and joined them on a number of actions. After stemming the tide of Jonas Savimbi’s UNITA army in Angola (an outfit many of the SA operators had previously trained), Executive Outcomes headed north to hold back vicious rebels in West Africa. This book is not only about triumph against adversity but also losses, as Venter relates the death and subsequent cannibalistic fate of his American friend, Bob MacKenzie, in Sierra Leone. Here we see the plight of thousands of civilians fleeing from homicidal jungle warriors, as well as the professionalism of the mercenaries who fought back with one hand and attempted to train government troops with the other, in hopes that they would someday be able to stand on their own. The American public, as well as its military, largely sidestepped the horrific conflicts that embroiled Africa during the past two decades. But as Venter informs us, there were indeed small numbers of professional fighters on the ground, defending civilians and attempting to conjure order from chaos. In the process their heroism went unrecorded and their combat skill became known only to each other. AL J. VENTER has been an international war correspondent for nearly thirty years, primarily for the Jane’s Information Group. He has also produced documentary television films on subjects from the wars in Africa and Afghanistan to sharkhunting off the Cape of Good Hope. Among his previous works are The Iraqi War Debrief: Why Saddam Hussein Was Toppled and Iran’s Nuclear Option: Tehran’s Quest for the Atomic Bomb. A native of South Africa, he is currently resident in the United Kingdom.